A really well presented apartment with ample space for two couples or a couple with children. Includes FREE Wifi / Freeview TV. We have keypad access so you can arrive anytime that is convenient to you. Easy parking is available downstairs (Wilsons) - there is an additional fee for parking. Available anytime, we won't be present and the door has a keypad for easy access. Walk straight out onto Tory St, and there are literally hundreds of restaurants and cafes within a 5 min walking distance. There is also a great grocery store round the corner, shops. Taxi from Wellington airport is around $30, otherwise there is an Airport bus which will take you in just 15 minutes. Uber is also available in the area. This is an owners apartment building, so it is important that you respect others. There are to be NO parties or loud music allowed. Smoking is allowed but only on the balcony (Ranch slider closed). - Swimming Pool and Gym on site: The pool and gym is on Level F of the carpark complex. The pool is owned by the Hotel and they have agreed for the occupants to use the pool and the gym provided this privilege is not abused. The pool is only a plunge pool – it is not very big and the equipment in the gym is not new, but does work. - PLEASE NOTE: There are 3 or 4 steps leading down to the front door of the apartment. This may cause complications for the elderly. Apartment as described. Interesting and practical layout. Quiet. 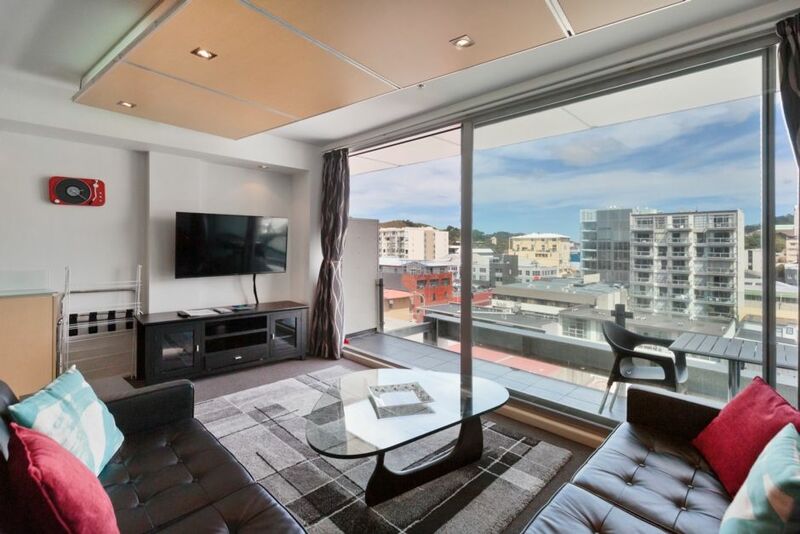 Close to waterfront, Te Papa museum and restaurants. Would stay here again. My reps arrived and it was already booked (someone else in the room). The error was quickly dealt with and an alternative arranged. Contact was apologetic. Secure, quiet apartment in a great location. We had several issues with this property. We had several issues with this property. First, the instructions said there were 2 key fobs in the box, but there was only one. Also, the dryer did not work. Finally, there was only one working fan. With no air conditioning, the second bedroom was very stuffy. The location was great though. Location was awesome, beds comfortable and great shower! Location was awesome, beds comfortable and great shower! !